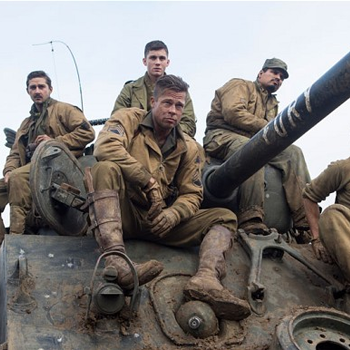 WWII tank actioner Fury is set to dominate the weekend with a strong opening at the Friday box-office. The Brad Pitt-starrer will likely do around $25 million for the weekend, displacing Gone Girl from the number one spot - though the Ben Affleck thriller is expected to hang tough at #2 and pass $100 million as a bonus. The "Day of The Dead"-themed family feature Book of Life will open in third place, posting strong box-office especially from increasingly-prominent Hispanic audiences. Also of note were impressive per-screen numbers for Birdman and Dear White People. The Michael Keaton-starring showbiz satire pulled $89,500 on only 4 screens (release is scheduled to expand); while college race-relations dramedy Dear played strong with $33,864 across 11. Both films have been touted as early award season contenders. Next week sees the release of two potentially strong challengers for the top spots: The Keanu Reeves revenge shoot-em-up John Wick and the Halloween-timed teen horror shocker Ouija. John Wick was so gooooood! Brutally stylistic action from start to finish!!! Just came to let everyone know that this movie is great. Go see it.